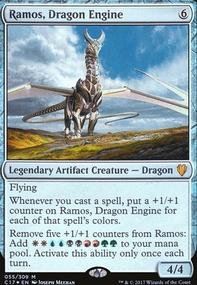 If I set down whip of erebos, can i activate it right away? Who gets the creature after assault suit dies? Also you really cant be nice with this deck at all, pick the slowest deck and go after them. If you stop attacking you will loose. I'm just going to say it, and if it makes me a target or a bad person I'm fine with it. SynergyBuild, do you like any cards? You are literally saying any card that costs more than 1 cmc is terrible, unless it's a 2 cmc spell that has a as part of it's casting cost. It seems to me that you want to maximize value from your mana base, and as such look for cards with the fewest color restrictions possible. What I am wondering is if you realize that the added colors or generic mana give the spells more power behind them? Sure, not all spells are designed as well. There are plenty out there that cost way too much for what they do, or they have colors that make it harder to cast and there are spells that do the same thing for less. Yes, there are always other options. But I question your reasoning behind this all? Just because you personally don't like these cards does not mean they are "bad" cards. As Boza said, they are insurance. Maybe you are playing a Golgari deck or something and your opponent brings out something like Panharmonicon and you don't want it to go off. Boom. Putrefy is suddenly looking quite good. Yes, there are obviously better cards in the same guild: Broken Bond , Crumble , Gleeful Sabotage , Naturalize , and Nature's Claim are all fine examples. But some of those are Sorcery spells! They are so much worse! They are garbage! Ew! Yeah, well, you want a list of cards or not? There you go. But part of building a deck is also finding cards that can do multiple things. Putrefy can remove creatures as well. Likewise, there are Go for the Throat , Doom Blade , Bone Splinters , Smother , Fatal Push , Walk the Plank , and Dismember all work wonderfully for creature spot removal. But do you know what these don't do? Remove artifacts. 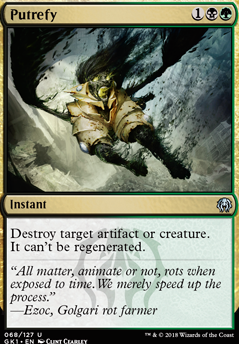 I'd rather have cards like Putrefy , Assassin's Trophy , and Abrupt Decay in a Golgari deck that can remove multiple types of threats, rather than hope I can top-deck in time to remove what is currently sitting on the field. Most of those you mentioned are played for one reason - they do more than remove a creature. Putrefy deals with 2 different, very powerful card types, while Mortify does the same. These are all bad cards, I agree, until the situation requires them. Then they are suddenly good cards. Think about them as insurance - if you never use it, it is simply money down the drain. Similarly with these cards, you pay the "cost" of a slot in your deck that helps you avert a bad situation. If that situation never comes up, good. But otherwise, you really hope you have them. 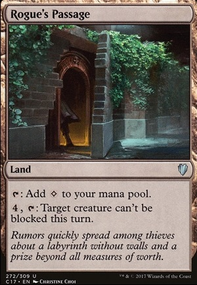 I will do it, however, the name is "Why Cyclonic Rift is overrated." not why it is trash. 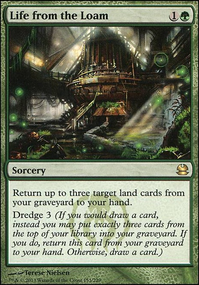 I will after I go over Cultivate / Kodama's Reach / Explosive Vegetation /3+ mana ramp spells being bad and why Utter End / Mortify / Putrefy / Anguished Unmaking are bad. Hey, DrukenReaps gave you good advice; keep it simple for your first Commander deck. Play one or two colors to start out :) Green Black is called Golgari and to get you started on your new Commander adventure with Golgari consider getting the Guilds of Ravnica Golgari Guild Kit? Scroll down the page to the Golgari one. 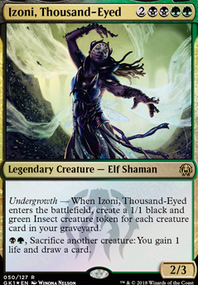 This Kit is selling for $20 and has many good cards you can use in a Golgari Commander deck including three different legendary creatures to choose from for Commander. The Guild Kits are in my opinion some of the best products Wizards has recently made. The value of the cards in the Kit is about $22. I second both of dbpunk's suggestions as Commander options for you to choose from. Jarad, Golgari Lich Lord is included in the Golgari Guide kit and is a budget Commander option, good creature to give trample. 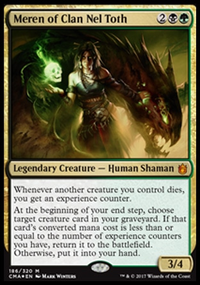 The Gitrog Monster is a more expensive price option as a Commander. If you can afford Gitrog go with him because not only is he a big creature who has deathtouch, but he's also a good creature to give trample too and his abilities are a little more complex than Jarad, more fun to build around and later expand on. Jarad can be a card in the 100 card deck of Gitrog.